I bought a bottle of this brew at Wine World during one of their End of Bins sale. I think it was back in the spring. Paid a $1 for the bottle. 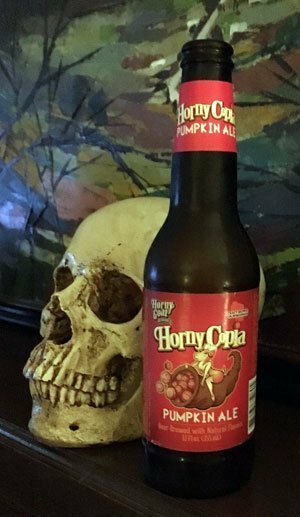 I just checked my notes and saw where Wine World had featured this brew at their beer tasting in October 2014. I couldn’t find a brew date on the bottle but then again I can’t say I looked that hard. I have no problem trying an older beer if I know I’ve kept it cold. It would be nice to be able to say for sure how it tasted when really fresh but if it tasted good when you drank it then it’s a good brew. I drank this Saturday night after Auburn intercepted against Ole Miss late in the fourth quarter and sealed the game. I continue my tradition of enjoying a pumpkin brew when Auburn is winning. When Michigan is playing a really tight game… or are losing, Mrs. Dan will clean the house. In years past our house has gotten pretty scrubbed down. This year she’s been much more relaxed and some dust has been allowed to live. Me, I start folding clothes. I folded several loads before I ran out. I then panicked because I couldn’t find my lucky Auburn hat. We won without it so I was able to enjoy my brew with a little less stress. So, given this is possibly 2-years-old you can take this review with a grain of salt. On the first sip all I got was the pumpkin spices and a general dryness. But on second sip things picked up. It started to taste a bit sweeter and started to taste more pumpkin between the spices. After a couple of sips there was on a long finish what I call a heavy dull malty flavor. Pumpkin pie is a pretty common description from the pumpkin brewing breweries. I think they succeeded here. I’ve found that the pumpkin brews are not as plentiful this year on local shelves. I’ve got enough to last the rest of the football season. I have to admit I’m trying to avoid buying 6 packs or seasonal brew packs because my waistline can’t handle all that beer. I’ll have to switch to Oktofest brews next year.